Exclusive 2nd Main for £1 at Prezzo Want some amazing food for less, get to Prezzo today and save! 30% Off Food at Prezzo Take advantage of amazing deals like 30% off when you dine at Prezzo! Kids Eat for £1 at Prezzo Feed the kids for just £1 when you visit Prezzo! 30% Off Food Bill with Click and Collect at Prezzo Staying in but want that restaurant feel? Prezzo offer a click and collect service with 30% off now! Express Lunch with Drink for £9.95 at Prezzo If you are in a hurry and need to eat, check out Prezzo's express lunch, you will be satisfied in a flash! 25% Student Discount Sunday-Thursday at Prezzo Save more if you're a student on your favourite meals, with Prezzo and Student Beans! Spring Set Menu - 2 Courses & Drink for £16.95 or 3 Courses & Drink for £19.95 at Prezzo Want something exciting to eat, check out Prezzo's Spring set menu today! Order Online for Delivery or Takeaway at Prezzo Order your delicious Prezzo meal now. Then decide if you want it delivered or are you gonna take it away! Vegetarian and Vegan Menus Available at Prezzo Not eating meat doesn't have to be restrictive. Enjoy a delicious host of vegetarian and vegan dishes at Prezzo today! Gluten and Lactose Free Options Available at Prezzo Eat without the worry if you're gluten or lactose-free. At Prezzo, you can enjoy a range of tasty options now! Gift Cards from £10 at Prezzo - Perfect Gift! Stuck for gift inspiration? Get them a Prezzo gift card! Tots Set Menu from £3.99 at Prezzo Feed the kids for less, get a Prezzo set menu from just £3.99! iPhone Users - Download the Vouchercloud App for More Prezzo Offers Check your favourite restaurants whilst on the go. Download the app today and enjoy big savings! Android Users - Download the Vouchercloud App for More Prezzo Offers Eat on your feet with mega deals and savings on the app. Follow the link to save a packet! The Prezzo Italian restaurant chain was founded in the year 2000, when its first restaurant in central London opened its doors. Now it has over 260 UK locations and has started moving into Ireland as well, with the first Prezzo restaurant opening in 2016. You can enjoy their authentic Italian menu and lively ambience more often if you keep an eye out for vouchercloud offers, and take the time to indulge in generous portions of pizzas, meats, fish, salads and of course, dessert. Prezzo has a few features that make it stand out among UK Italian restaurant brands, one of which being the buildings it chooses for its restaurants, which are often places of local significance or which have interesting or historical architecture. This means that in many UK towns, Prezzo restaurants are highly recognisable landmarks as well as great places to go for authentic Italian cuisine. With options that the whole family, friends and couples alike can enjoy - it's always the occasion to head to Prezzo. How do I use my Prezzo voucher? Choose the discount voucher you want to use and click on 'View Deal' to receive your code or printable voucher (if one is required to claim the deal – the offer details will tell you if voucher or code is needed). For online discount codes, enter them when prompted when you order online. If you are a fan of Prezzo, you can download their app for iPhone or Android, which can keep you up to date on offers and promotions at your local Prezzo restaurants. What can be even more useful, is that you can also pay using the app. This can make it a lot easier to pay when you are in a rush (for instance on your lunch break), or when you want to split a bill with the people you are eating with. When are Prezzo restaurants open? Prezzo locations are open for lunch and dinner 7 days a week, however, the specific opening times vary between locations. You can find your nearest Prezzo branches and see their opening times, as well as book tables and find contact information on this page of their website. Do Prezzo restaurants offer Free Wi-Fi? There is free Wi-Fi available for customers at every Prezzo restaurant, including in outdoor seating areas. Does Prezzo cater for people with special dietary requirements? 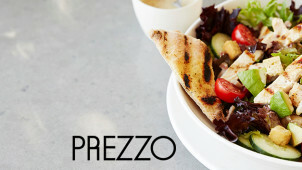 Prezzo provides full allergy information on their website, and have a range of gluten-free and lactose-free menu items. For vegetarian and vegan customers, the menu is clearly labelled to help you identify suitable dishes, and there is a good selection to choose from. In addition, because all of Prezzo's pizzas are made to order, you can choose any pizza you like and ask to leave off any non-vegetarian or non-vegan toppings, or create your own pizza with toppings of your choice. Prezzo doesn't currently use any halal meat, though again, there are some good meat-free options to consider if you follow a halal diet. Opening times may vary, and may be subject to change on public holidays. Prezzo is the leading UK chain of Italian casual dining restaurants, offering a taste of Italy from authentic pizzas, pastas to meat and fish dishes, along with a great selection of Italian wines by the glass, bottle or carafe. With a Prezzo voucher, you can enjoy a summer lunch or dinner in their restaurants for less anytime. With 260+ restaurants nationwide, Prezzo is the Italian choice for couples, families, friends and even large groups. Their menu caters for all kinds of dietary requirements and here, you can make every occasion a celebration. Dine out the Italian way and book your table at Prezzo. Buon appetito! Prezzo, which is Italian for ‘price’, even caters to different dietary requirements without charging an extortionate amount of money! With gluten-free, vegetarian and vegan options available, it'll be easy to spend time with your favourite people this summer! Perfect for eating out with the kids too as Prezzo offers 2 affordable menu options. Both the 3-course Kids’ menu for 5-11 yrs and the Tiny Tots menu for small tummies are designed to appeal to even the pickiest of eaters. Jazz up your working week, or make this weekend with your friends extra special by booking a table at your nearest Prezzo. From pasta dishes which are a delight and truly worth indulging in to pizzas, fizz and money off your bill with your Prezzo vouchers from us, you'll be able to enjoy a real Italian feast for less! Delve into generous sharing dishes and get children of all ages involved with separate items from the tiny tots and children's menus.